Meteor 1-1, the very first version of the Meteor satellite network, is performing its final orbits after having spent more then 4 decades in Earth orbit. 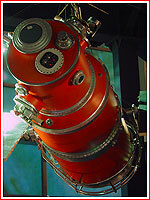 The Meteor satellite series was developed in the Soviet Union during the sixties. It was preceded by Kosmos-44 – an experimental weather satellite launched on August 28, 1964 – which transmitted TV images of cloud cover. On March 26, 1969, a Vostok rocket launched Meteor 1-1, Russia’s first fully operational weather satellite, into orbit. With a mass of 1200 to 1400 kilograms, a length of 5 meters and a diameter of 2.5 meters, the Meteor 1-1 spacecraft was originally placed in an orbital altitude of 650 km. Two solar panels were automatically oriented toward the sun to provide the spacecraft with the maximum amount of solar power. Meteor 1-1 used a gravity-gradient triaxial stabilization system to orient towards Earth. Onboard the spacecraft we find two vidicon cameras for dayside photography, a scanning high-resolution infrared radiometer for dayside and nightside photography, and an actinometric instrument for measuring the earth’s radiation field in the visible and infrared regions. The instrument are located on the side of the satellite pointed toward the Earth, while the solar sensors are mounted in the top section. The successors of the Meteor 1-1 included the Meteor 2-2, Meteor-Priroda, Meteor-3, and Meteor-3M. The Meteor-M 1-2, the last of the series, lifted up onboard a Soyuz -2-2b rocket in 2009. The basic design did not change very much over the years. On June 2, 2011, I obtained relatively clear images of the spacecraft, sufficient to show the solar panels and to make it possible to distinguish the smaller end from the thicker end of the cylindrical satellite body. These images were taken from a range of about 425 km. Despite 43 years in orbit, at the time the Meteor-1-1 satellite was still flying at a ‘safe’ and stable altitude of around 400km. In March 2012, 9 months later – I found the spacecraft in a very low Earth orbit of around 250 km. Its orbit seems to have lowered quickly in the last months, and when I took the images on March 20, reentry was predicted to take place around March 25. At the time of writing, the reentry is estimated to happen a few days later. The satellite appeared near the Southern horizon and moved to an altitude of 80 degrees toward the North-Northeast with the expected high angular speed. During the first part of the trajectory, the satellite appeared relatively steady, but its brightness dimmed very quickly just before elevation, brightening up again at the point of culmination. These are typical signs of low rate tumbling. Indeed, the frames captured show clear signs of tumbling motion of the elongated satellite body, with an alternation of the long side and the short side of the spacecraft’s body. The moments of minimum brightness correspond with visibility of the short side. The best images from this session show a surprising amount of detail of the satellite and its solar panels. Another picture from the March 20 imaging session showing a good view of the solar panels and some smaller structure on the satellite body. On March 21, one day later, I observed the spacecraft again, this time about 20 degrees lower through the Southeast. 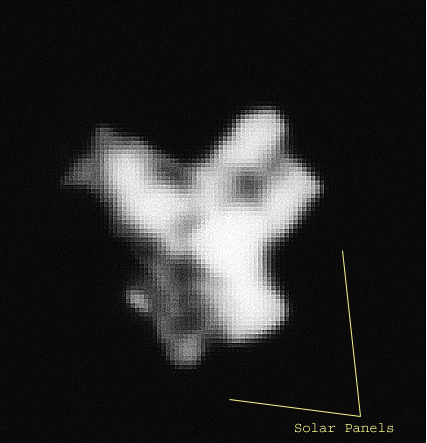 This time, it was easy to see it with the naked eye as an object with a similar pattern of brightness variation. According to data provided by the astronomical calculator Calsky, the satellite sank 5 km in altitude during the last 24 hours. Soon, another monument of spacecraft history will reenter the atmosphere after spending 43 years in Earth orbit.